PORTAL ZA TAEKWONDO NATJECANJA | European Tae Kwon Do International Championship 2019. 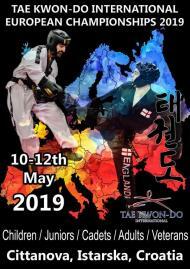 Odabrano natjecanje: European Tae Kwon Do International Championship 2019. Many countries are currently living in a difficult time in global economic history. It is thus our goal to provide a world class event which will be affordable and fair to all competitors. Our ambitions are revolutionary. We aim to being General Choi's global Taekwon-Do family together in Novigrad-Cittanova, Croatia. Be a part of the revolution!